Eta: Can This Bullet Shaped Bicycle Hit 145 Km/h World Record? 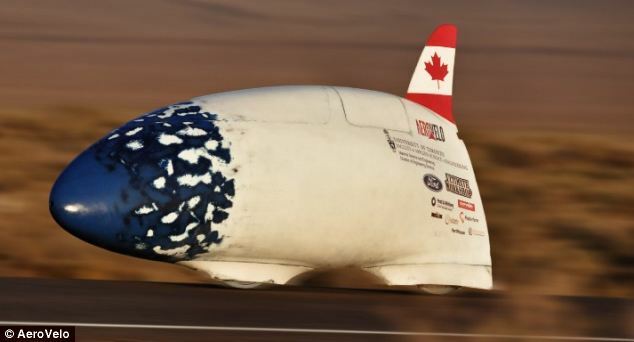 A team of Canadian students claims to be designing the world’s fastest human powered machine in the form of a bicycle. The bicycle can attain a top speed of 145km/h with one rider. The astonishing bicycle is called Eta and will appear in a race this year in September. The team designing Eta is being led by the Cameron and Todd at AeroVelo. The bicycle resembles more to a rocket than a bike. According to the team leaders, the mission is to create a design that could inspire the public and deliver more with less effort. The bicycle has a claimed top speed of 145km/h with one rider. The company is known for its creativity which includes a human powered helicopter and few planes. The company takes the best engineering students on yearly basis and assigns them challenging tasks. This year’s invention is the world’s fastest bicycle, Eta. The engine of the bicycle will be producing only 1HP which is 100 times less than a traditional car but an efficient design will allow to achieve car’s speed. The name, Eta is given because of the efficiency of the bicycle, it is the same symbol used for efficiency in Engineering. Students spent couples of months to minimize the forces of resistance. To reduce the aerodynamic forces, a bike has been given a streamlined shape to reduce them up to 20 times. The team will make the bicycle ready in September for the World Human-Powered Speed Challenge in Nevada. Off the shelf components are being used by the company where applicable. The project will be seeking funding from Kickstarter to raise $30,000. A lot of time has been spent by the team for prototyping, testing and finalizing the bicycle.